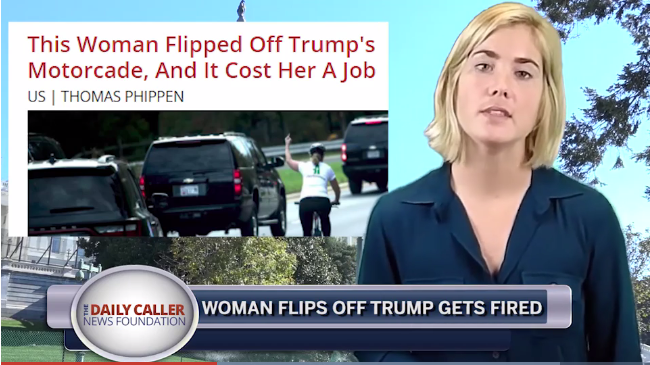 You’ve probably seen the viral picture by now that shows a woman flipping off Trump’s motorcade while she was riding next to it on her bike. What you may not know is that she’s been let go from her job as a result of that unfortunate photo. Briskman worked for a company called Akima LLC, which does marketing and communications work. Unfortunately for Briskman, they also hold several government contracts. Upon seeing the viral picture, the company pulled her into their office and what happens next can be summed up in this beautifully ironic 10-second clip. Apparently, they were concerned that the picture might affect their ability to win government contracts in the future and wanted to terminate their relationship with the woman who brought it to their doorstep. A wise move, if you ask me. Oh, but this didn’t make her rethink her stance. In fact, she’s doubling down! Aside from the fact that this woman probably got all of that information from MSNBC, where was this angry picture when Obama was golfing and the world was on fire? Something tells me her rage is exclusively aimed at Trump because he’s a Republican and that she doesn’t actually care about the people being afflicted by his policies. I’m glad this woman was fired. I can’t think of a better way to celebrate than with the above montage of Donald Trump clips and a smirk.